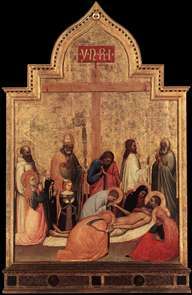 Italian painter, who probably painted the S. Remigio Deposition in Florence (Uffizi) which was regarded as a work of Maso di Banco by Vasari and earlier writers. The distinction of hand is evident, but it is by no means certain that Giottino was identical with a Giotto di Maestro Stefano who was painting in the Vatican in 1369, who in turn cannot be reconciled with Vasari s Maso/Giottino figure. No other work can reasonably be attributed to the painter of the Uffizi Deposition, unless one accepts the attribution of it to Orcagna s brother Nardo di Cione. See more details about "Pietà of San Remigio"